Bears feast as natural gas saw broad, steep declines across the strip on Monday. 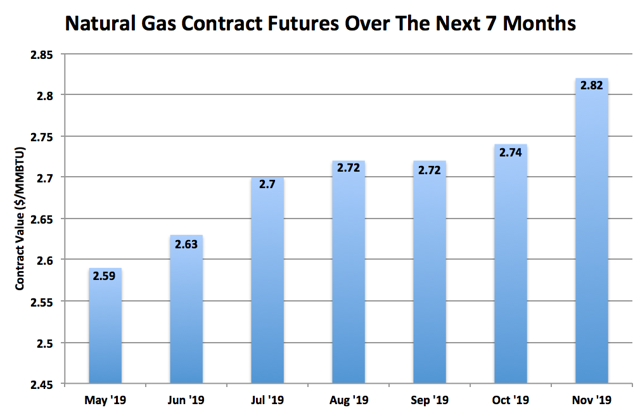 Natural gas front-month May contract breaks below $2.60 amid markedly warmer weather outlook mid-late April. Cash markets also lowered on prospects for warmer weather and lighter demand. Warmer outlook boosts injection season; triple-digit inventory builds expected in the weeks ahead to yield more aggressive storage deficit contraction. Cheapened natural gas prices a buying opportunity for investors wanting to go long for this upcoming summer season. 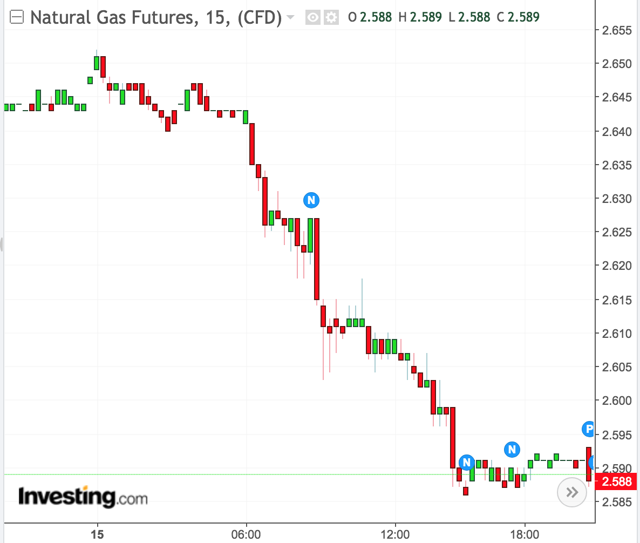 Warmer weather outlook over the weekend made its mark on Monday as natural gas futures plunged more than 2.5% to break below $2.60. The recent slide has undoubtedly made price more attractive. It's an opportunity for investors to go long for this upcoming summer which is projected to be hot. Investors also need to continue to monitor LNG exports and natural gas production. 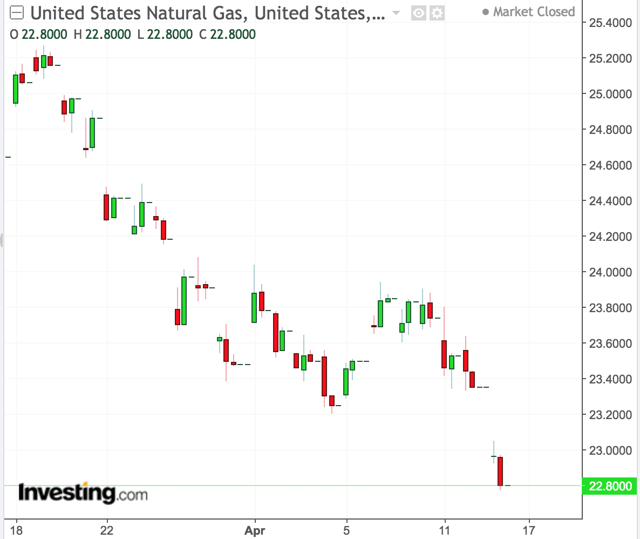 From futures to the cash market to ETFs, the entire natural gas strip saw steep declines on Monday. The front-month May futures contract consolidated 7 cents (2.60%) to $2.59. The June contract fell 7.1 cents to $2.63. Figure 1 below is a chart showing the price trend of NYMEX's front-month May futures contract over the past 24 hours. Figure 2 is a chart showing the latest natural gas futures contract prices over the next 7 months. We remain in contango through August. 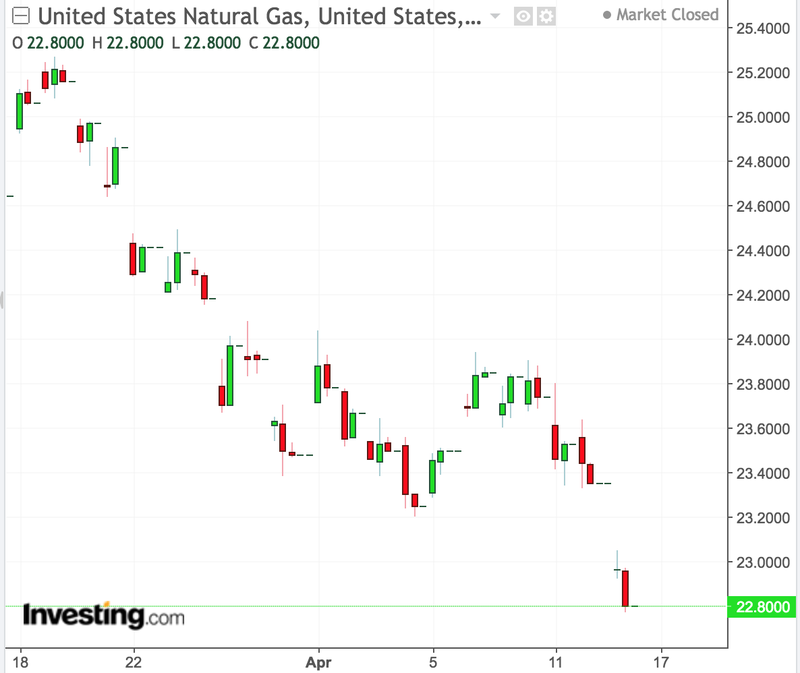 The United States Natural Gas ETF (NYSEARCA:UNG), which is the unleveraged 1x ETF that tracks the price of natural gas, finished Monday sharply lower down 2.36% to $22.80. Figure 3 below is a chart showing the price trend of UNG over the past month. 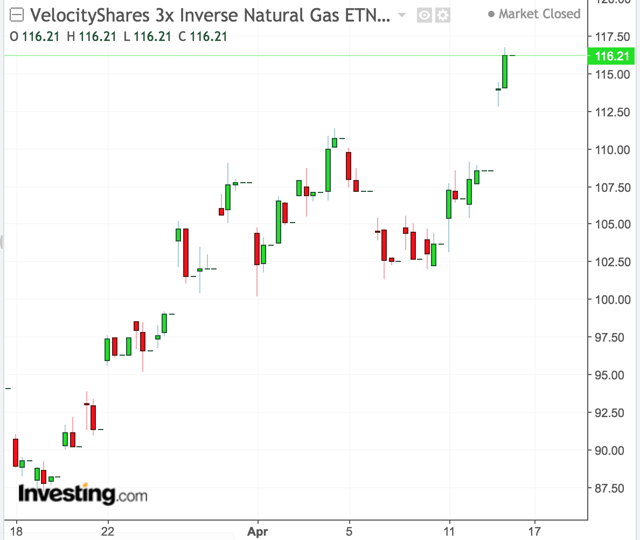 The VelocityShares 3x Long Natural Gas ETN (NYSEARCA:UGAZ) and the ProShares Ultra Bloomberg Natural Gas ETF (NYSEARCA:BOIL) consolidated 6.96% and 4.30% to $26.48 and $19.35, respectively. 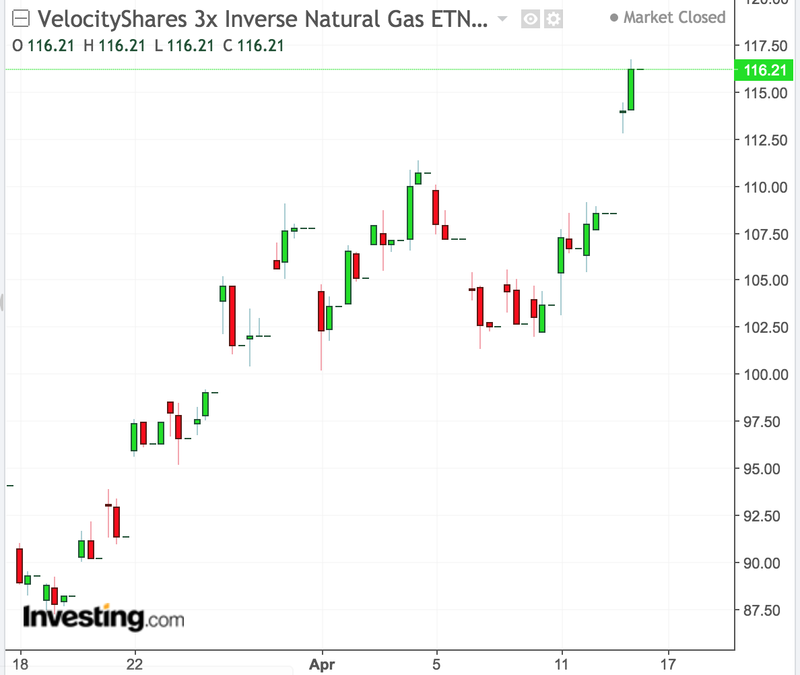 Meanwhile, the VelocityShares 3x Inverse Natural Gas ETN (NYSEARCA:DGAZ) and the ProShares UltraShort Bloomberg Natural Gas ETF (NYSEARCA:KOLD) gapped up 7.05% and 4.42% to $116.21 and $23.62, respectively. Figure 4 below is a chart showing the price trend of DGAZ over the past month. Monday's market reaction was as a result of forecast models in the medium range trending warmer over the weekend. This comes after a week of tight range trading as investors continued to gauge the strength of mid-late April demand amid mixed forecast model signals, a reduction in production, an increase in LNG exports, and an overall cooler weather pattern. Cash markets also experienced losses on Monday due to the warmer weather outlook and thus less demand. Losses were greatest across the western U.S. where the Rockies (Opal) and California (SoCal Border Avg.) had declines of $0.67 and $1.03, respectively. Losses, albeit lighter, also occurred east of the Mississippi River where Chicago and Henry Hub experienced declines of 6 cents and 8 cents, respectively. Forecast models continue to indicate a warmer (bearish) pattern in the 10-16 day time frame with seasonal to unseasonably warm temperatures covering much of the country. Figure 5 below is a comparison between the 0z GFS, ECMWF, and CMC's 10-16 day temperature outlook. 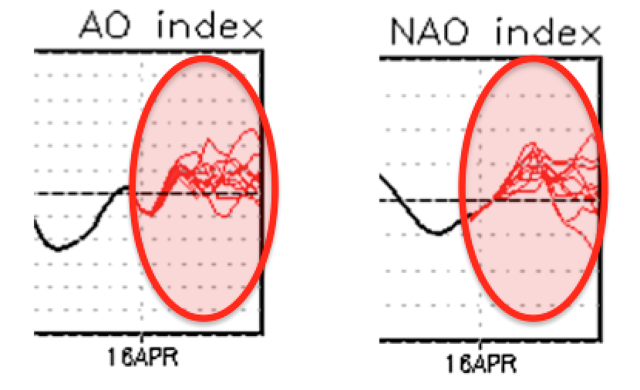 Figure 6 below are forecast of the Arctic Oscillation (AO) and the North Atlantic Oscillation (NAO) teleconnections. Both are forecast to transition back into a neutral to positive mode over the next two weeks. This supports a warmer outlook for the nation. Monday’s sharp decline has brought prices to its lowest level since mid-February. Much of the prices downside risk has been applied after Monday’s reaction. While there is still potentially more room for prices to go down, I think that it's reached near a bottom. Under $2.60 now, prices have certainly become more attractive for investors looking forward to this summer. Should prices continue to decline towards $2.55 and/or to a greater degree $2.50, then it would make for an even greater opportunity for investors to start buying. In addition to weather updates, this week’s storage report, production (supply/demand) report, and LNG exports will also be important as these could potentially add or offset from the bearish sentiment. I'm keeping my price range of $2.50 to $2.80 for the front-month May contract. UNG should trade between $21.00 and $24.60.